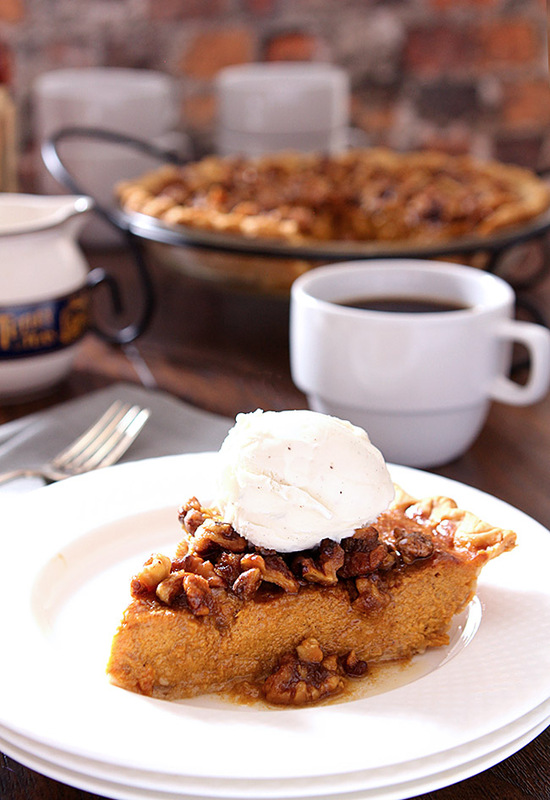 Dress up that pie and try this Bourbon Pumpkin Pie with Toasted Walnuts; you’ll never be satisfied with plain pumpkin pie again! I’ve always liked pumpkin pie OK but for many years never really loved them; certainly never craved them at Thanksgiving like some folks do; pecan pie was my favorite. Maybe it’s too many store bought, cardboard crust, metal tin, cafeteria style boring pies that turned me off, so I’m always experimenting and looking for one that suits me because I really think there is potential. This Bourbon Pumpkin Pie with Toasted Walnuts, for me, seems to be the best of everything; classic Pâte Brisée pie crust, creamy pumpkin filling (with bourbon) and a crunchy walnut (or pecan) topping with more bourbon. What’s not to love? I used brown sugar in this recipe too; it just seems better suited for a pumpkin pie with bourbon or maybe it’s just because I love brown sugar that I decided to use it. And it certainly also doesn’t hurt to have all of that creamy goodness topped with a crunchy topping. 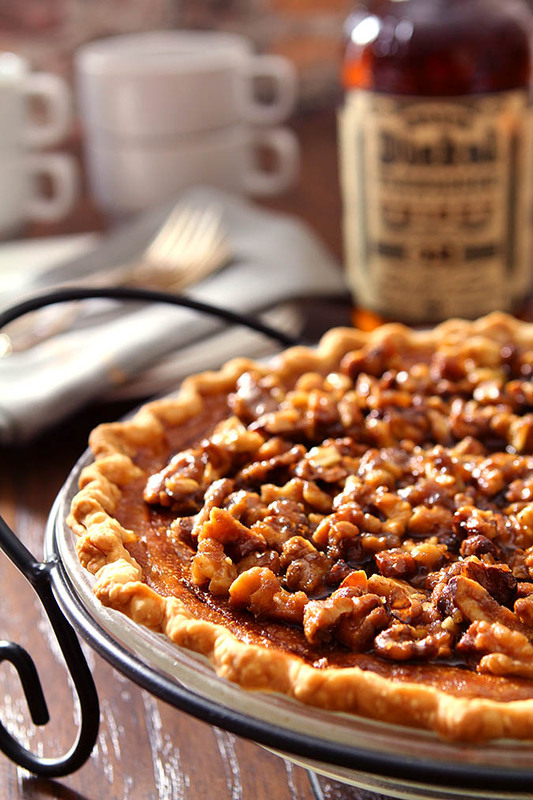 When I first made this pie in 2010; I posted it but I had used pecans with the bourbon topping and I’ve since become such a fan of toasted walnuts I tried something new. Either one is great; use what you prefer but toasting them prior to mixing them up with the other topping ingredients is key. I made this for dessert this past Saturday when I had friends over for dinner. One neighbor who is a bit of a picky eater had a bite of his wife’s pie and declared that he didn’t normally like pumpkin pie but he liked this. Music to this food blogger’s ears I tell ya; nothing makes me happier than making someone else happy with food I’ve made in my kitchen especially if it can turn them on to something they heretofore didn’t care for. You might not have noticed but the bourbon that is poured on top is flamed. I really tried to capture that in a photo but it was not my day; maybe my concern with not wanting to also burn up the house entered into the equation so while you are missing a photo with a blue cast on the top of the pie, you are actually getting a photo at all and not a shot of my burned out studio. I figured it was a good trade. If you like the idea of these ingredients together, you might also enjoy this Brown Sugar Pumpkin Cheesecake with Bourbon and Toasted Walnuts; it’s a bit more trouble but has the same great flavors. I made it for Thanksgiving last year for the first time and everyone just loved it. Combine all ingredients for filling, mix well and pour mixture into unbaked pie shell. Bake at 425 for 10 minutes then reduce heat to 350F and bake additional 45 minutes or until set. Cool. Combine the butter 1/4 cup of brown sugar in a saucepan; cook over medium heat, stirring until the sugar is dissolved. Add the nuts and 3 tablespoons of bourbon, stirring to coat the nuts. Spoon the mixture over the pie. I’ve said it before and it’s really true; I bake more with bourbon than cook with it especially in sweet dishes. Like coffee and chocolate, bourbon and sugar are meant to be married! Mmmm booze… I mean bourbon certainly does make everything better! I would definitely ask for a slice of this if confronted with a Thanksgiving dessert buffet. I love pumpkin pie but this puts it over the top…. and makes it festive! It was truly fantastic and I’m serious about the neighbor; he’s sort of picky so when he said he liked something he didn’t normally like? I felt like I had won the lottery!